Missing permanent teeth or premature loss of baby teeth is one reason why the American Association of Orthodontics (AAO) recommends an orthodontic consultation for children beginning at age 7. The upper lateral incisors, second premolars and third molars (wisdom teeth) are the teeth most likely to fail to develop or erupt. 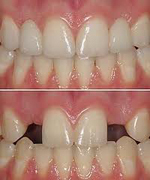 Heredity is considered a major factor when permanent teeth are congenitally missing. To determine whether or not teeth are actually missing, x-rays must be taken and carefully evaluated by Dr. Lisa P. Howard DDS MS. At times, a tooth may not actually be missing, but hidden underneath the gums and in poor position, preventing normal eruption and requiring orthodontic treatment to bring the tooth into alignment. When permanent teeth are missing, an orthodontic consultation by Dr. Howard will determine if the space caused by the missing teeth can be closed or remain open, requiring a replacement to fill the space and maintain the bite. Without orthodontic treatment, the teeth on either side of the missing tooth will move randomly and tip into the open space, causing poor tooth alignment, bite problems and bone loss as we age. If the problem is diagnosed at an early age, a simple appliance (space maintainer) is placed to hold the space and makes orthodontic treatment easier, when all the permanent teeth erupt. In some instances, if a space maintaining appliance is inserted and all the other teeth erupt normally into the mouth, orthodontic treatment can be avoided after wearing a very simple appliance. A general dentist can then replace the permanent tooth, if it is missing, when the child is old enough, with an implant and crown or another type of permanent replacement. A permanent tooth is missing underneath the X. 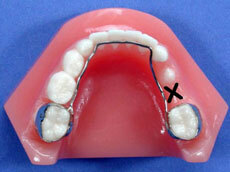 The appliance holds the molar in position while the rest of the permanent teeth erupt. The appliance is cemented on the teeth so you don’t have to worry about it as long as the patient is brushing their teeth regularly and staying away from sticky foods.